Plot – A cab driver and an unexpected passenger descend into a night of darkness. 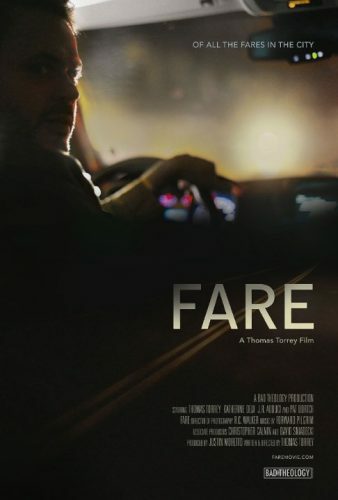 Fare is a Drama that turns Thriller almost Horror type of film. The film is about a Uber and or Lift driver who picks up fares. While getting to slowly Know this guy we finally find out why he is picking up passengers. He wants to get out of the house and the rel-estate market is drying up. Of Course we find out his wife is having an affair on him. After a few passengers and one weird one who sits up front helping him out through philosophy reasoning speaking in riddles to an average listener. We finally get to are last Passenger who are main lead knows as it’s the guy his wife is seeing. Now he didn’t stalk this guy he was just his next passenger via through the app of what ever service he is working for. Slowly we get in to the conversation, normal back and forth and of course the passenger doesn’t know the driver. It finally breaks and know knows. The film turns in the last 25 minutes to a Thriller Horror when they Driver and Passengers find a Body in the road. The ending is weird as I’m still not knowing the purposes of the action of what went on and why the mask comes off. Now you have no clue what I’m saying as I don’t want to give anything away. Fare is shot entirely inside the vehicle as if we are a fly on the wall, Yes we get different angles while inside. The acting was surprisingly good as most times the acting is not all the great on short and low-budget films. The story or plot is pretty small but does entertain through the conversations which is what the film mainly consist of. Overall I felt Fare was a good watch and a perfect length hitting the mark 15 minutes over an hour. Any more time allotted I might have found it struggling. The Conversations between the Are lead which by the way is the Writer and Director (Thomas Torrey) and are Last Passenger who is the Guy seeing his wife are pretty good and interesting. With that said I give Fare a 4 out of 5 as for me it was and interested view. For some they might find it slow or boring or evening might go in thinking it’s all thriller and or Horror which only hits the film for 15 minutes. If you get a chance to see the film at a Film Festival as which it is showing in just a day or so while I write this, give it a chance. Newport Beach Film Festival on April 26 at 8:30 PM.